If you take your cues from the shops that sell greeting cards, home decor and craft supplies, spring is a season of pastels. I like yellows mint greens and lavenders as much as the next person, but the truth is that they don't really satisfy my pent-up hunger for color in the garden. 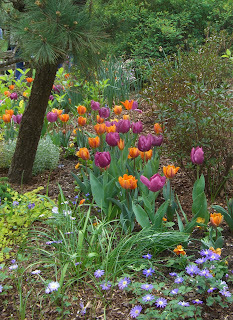 That's why this bed of tulips thrills me. The color scheme may seem too shocking for a neighborhood garden, but it is based on sound color theory. It's a split complementary combination. On the color wheel, reddish-orange and magenta lie on either side of red. Red's complement is green, conveniently represented by the spring foliage. Color theory in action. Who says you’ll never use that stuff that you learn in school?